J'aime​​ means "I love". Our name says it all - we love events! We provide full-service wedding design and event planning dedicated to managing all the details that go into planning an event that will leave you and your guests in awe. From the initial consultation to the day of the event, we take on your event as our own and plan it to meet our impeccably high standards. All while making sure you’re simply able to enjoy the party. We offer full service event planning for any type of celebration. Congratulations! Let us help plan the details of your wedding day so you can enjoy every moment. Celebrating time doesn't need to take a lot of time. Let us help plan your anniversary. Let us help make your milestones into memories! You did it! Now it's our turn to do some homework! 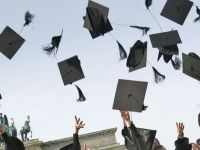 We'll manage all of the details of your graduation celebration. Life is a party that needs to be celebrated. Contact us for help with all of your celebration needs. From Bridal to Babies, let us cover the details.